Merry Christmas to all of my wonderful readers, family and friends. Wishing you all a very happy holiday season! 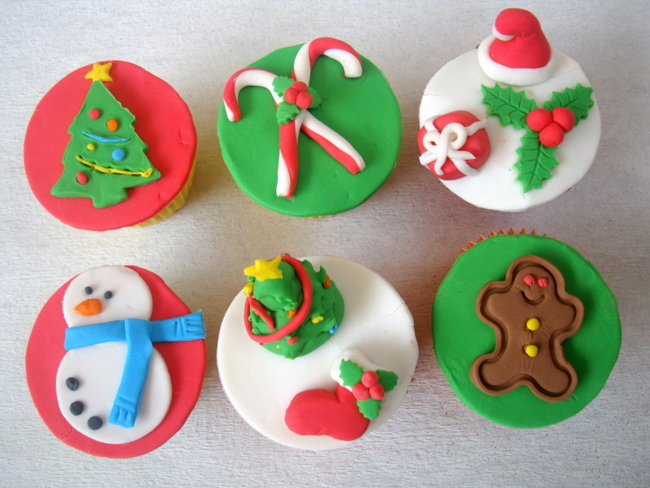 Last week, I baked a batch of Vanilla cupcakes with Nutella frosting and decorated them with Christmas fondant/sugar paste toppers for Nehal and his friends. Last week, I also prepared a simple dessert for kids with the left over chocolate mud cake chocolate buttercream frosting that was sitting in the fridge. 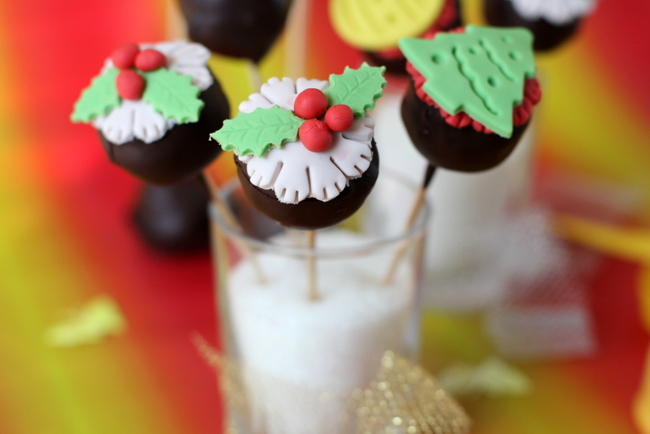 A piece of cake on a stick, ‘Cake Pops’. I drew inspiration from the queen of cake pops – Bakerella. Do visit her website, if you haven’t yet, for lots of cake pop inspiration, gorgeous photos and techniques on decorating. In a large bowl, crumble the cake with your fingers such that it resembles coarse bread crumbs. Add half a cup of frosting to start with and using a wooden spoon mix it. You can use your hand to mix the frosting into the crumbs.Take a lemon sized amount of the cake mixture and try to form a ball with the palm of your hands. If it forms a ball shape and the dough does not crumble then there is no need to add any more frosting. If the balls fall apart, add a little more frosting until the mix is moist enough to hold shape. Continue to roll the rest of your cake mixture into balls and place them on a parchment paper lined baking sheet. Place these cake balls in the refrigerator and chill for 30 mts. While the cakes balls are chilling in the fridge, melt the chocolate. Take a lollipop stick and dip half an inch of one end in the melted chocolate and stick it about half way through the cake ball. Do not pierce too deep or the cake ball may fall apart. The chocolate will help adhere the stick to the cake ball. Place the cake balls back onto the parchment paper and repeat process with all the remaining balls. Place the cake pops in the freezer for another 20 mts before coating with the chocolate. If the cake balls are chilled, it will be easier to get the cake to stay on the stick while dipping and tapping the excess coating off. So don't skip this step. 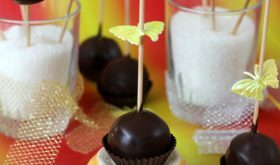 Dip each cake ball into the melted chocolate ensuring that the coating covers the entire cake ball, Gently tap off the excess coating while rotating the cake pop to get a even layer all over the cake ball. Stick them in a piece of styrofoam and allow them to dry pop side up.You can top with sprinkles or chopped nuts before the coating dries up. Serve them once the chocolate is set. The amount of frosting might vary and I have mentioned just an approximate amount in the recipe. Start by adding a tbsp of frosting at a time and mix. Add just enough frosting such that the cake mixture holds shape when trying to form a ball. Vanilla cake with vanilla butter cream frosting and white chocolate coating makes for a good flavored cake pop. These cake pops can be frozen for weeks. Candy melts that are colored can be used to make colorful cake balls. You can make different flavored cake balls, vanilla, chocolate, strawberry etc. I used chocolate mud cake and chocolate buttercream frosting that I blogged earlier to make these cake pops. 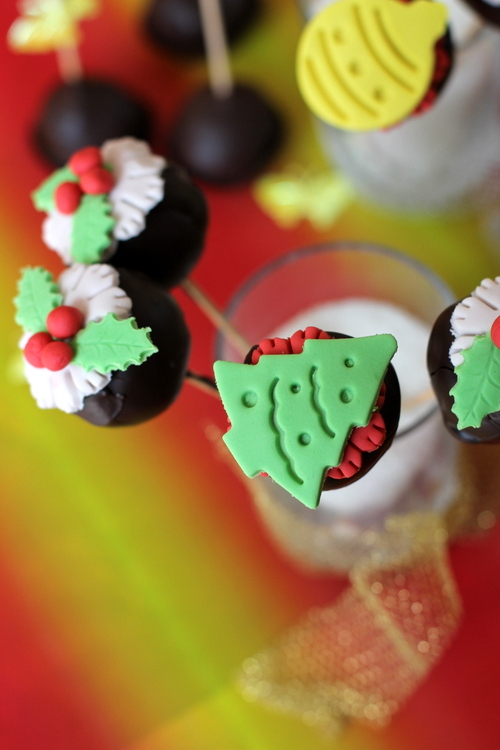 By Sailu Published: December 25, 2012 One of the simple dessert recipes I made this holiday season are Cake Pops. 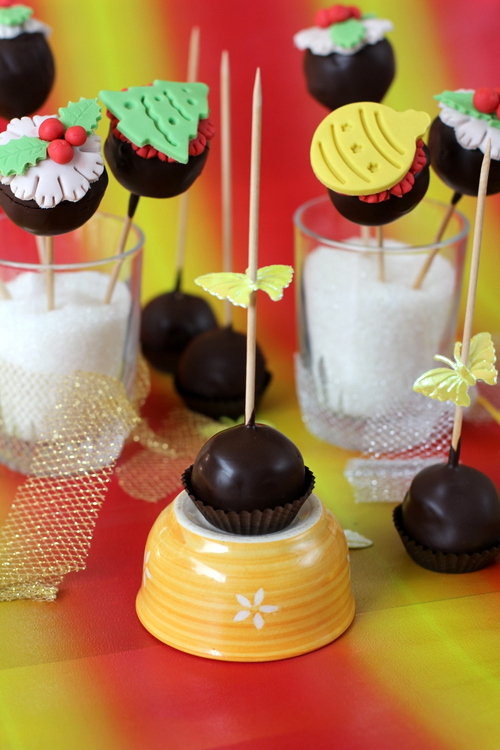 Learn the recipe of Cake pops that are a kids delight. 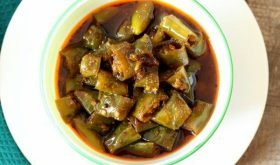 Wow havent tasted it yet but will surely giv it a try! my daughter has been demanding cake pops for a while now! about time I make them Sailaja! awesome pics as always! looks sensational sailu! happy new year to you and the family! I had seen cake pops in one of the party we attending. Finally I get to see them here. Can you share with us the recipy for the fondant/sugar paste. from where we get these shapes? My kids become a fan of you…..and i am the best mom now.